Otofaji nedir? Otofaji ne demek? Professor, Sabanci University, Molecular Biology, Genetics and Bioeng. Program. Research Team Leader, SUNUM Nanotechnology Research and Application Center. Founding Board Member, EFSUN Nanodiagnostics Center of Excellence. 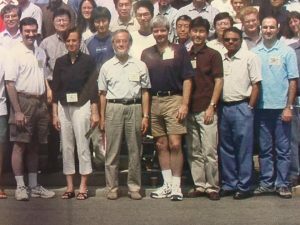 International Council Member and Affiliate Member, Autophagy, Inflammation, and Metabolism (AIM) Center of Biomedical Research Excellence, University of New Mexico Health Sciences Center, USA. Board of Directors Member, International Cell Death Society, USA. Looking for young talents to join our team (Genç yetenekler aranıyor). Successful, skilled and highly motivated PhD student and postdoctoral researcher candidates click here for details. Türkçe açıklamalar için buraya tıklayınız. Our new “heavy weight” paper published in the Autophagy journal. A new mechanism of autophagy amplitude control: MITF-MIR211 axis is a novel autophagy amplifier system during cellular stress. Click on the Link. Our new paper on a very hot topic (both in basic science and drug research) published in Frontiers in Cell and Developmental Biology: “Crosstalk Between Mammalian Autophagy and the Ubiquitin-Proteasome System“. Click on the Link. Prof. Gozuacik invited to give a talk in the the Annual Meeting and Symposium of the NIH-funded Autophagy, Inflammation, and Metabolism Center of Biomedical Research Excellence in the US.To see the Scientific Program click here. 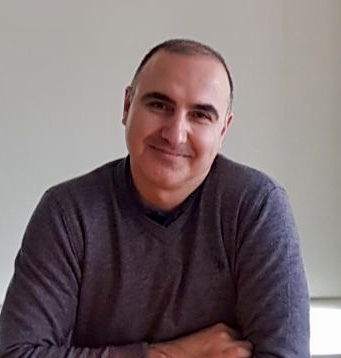 Prof. Gozuacik invited to serve as a chair of the “Autophagy in Metabolism, Growth Control and Cancer Session” in the prestigious Keystone Conference on Autophagy (February 17—21, 2019, in Eldorado Hotel & Spa, Santa Fe, New Mexico, USA). To see the Scientific Program click here. The Nobel Prize in Physiology or Medicine 2016 was awarded to Yoshinori Ohsumi “for his discoveries of mechanisms for autophagy“. Click here for details. (The photo was taken during the 1st Gordon Research Conference on Autophagy: Prof. Gozuacik next to Prof. Ohsumi). 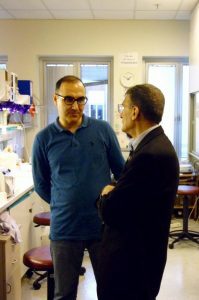 Nobel Laureate Prof. Aziz Sancar visited Sabanci University and Gozuacik Lab in 2016. 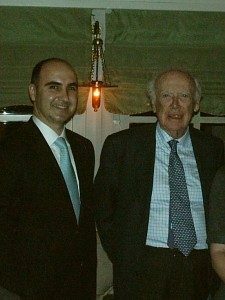 Nobel Laureate Prof. James D. Watson, the father of DNA and the Human Genome Project dining in Istanbul with Prof. Gozuacik and EMBO Awardees from Turkey in 2011.